This is a really good, encouraging story about a community together with Western Oregon University (WOU) taking the lack of credentialled, bilingual teachers into their own hands. 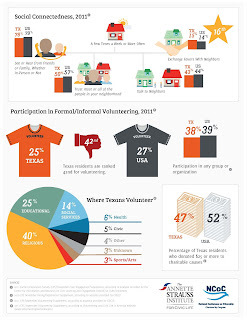 There is a community already in place that is poised well for this opportunity. This of course requires a larger set of agreements such that once the candidate graduates from WOU, they are guaranteed a job interview in their home school district as part of the deal. They also get "mentoring, guaranteed summer jobs as classroom tutors and extra academic support if they want it." Oregon schools are finding it nearly impossible to hire enough bilingual teachers to staff dual language immersion and English as a second language classes. During 2014-15, only 81 new teachers earned an Oregon teaching license in those specialties. The Salem-Keizer district alone needed to hire 79 more bilingual teachers this year. Dónde encontraran a todos los maestros? Western Oregon University, that's where. In partnership with three large school districts, Western has created a special program to encourage high school graduates who read and speak both Spanish and English to become bilingual teachers. Already, 45 young Oregonians from Salem, Hillsboro and Monmouth are on that path as freshmen at Western, with plans to graduate in 2019 as fully credentialed bilingual teachers. As part of the program, they are guaranteed a job interview in their home school district. Western hopes to add that many freshmen or more at its Monmouth campus every year to the pipeline of future bilingual Oregon teachers. Salem-Keizer Superintendent Christie Perry and Hillsboro Superintendent Mike Scott said they are thrilled to know they have a bevy of Western-prepared bilingual teachers headed their way soon. "These students are critical to meet the high demand that exists today and will continue to grow," Perry said. Western's program offers entering freshmen who are proficient in Spanish and English scholarships and extra pre-professional support to encourage them to pursue a teaching career. They get mentoring, guaranteed summer jobs as classroom tutors and extra academic support if they want it. The vast majority of the first group of students are from Spanish-speaking families and learned academic English and academic Spanish at school, said Western's dean of education, Mark Girod. Many of them are also first-generation college students, he said. A few are native English speakers who learned Spanish very well during high school and will continue to develop Spanish expertise while in college, Girod said. So far, the program is only offered to graduates from the three sponsoring school districts. Western's associate provost, David McDonald, said other school districts with the same need for bilingual teachers want to join in. Western would first need to raise more money to pay for the scholarships, he said. This video on the protests at Yale has gone viral. Just came across this excellent reflection on this blog post titled, "The Student Demand," by Tav Nyong’o. She takes on the haters that say that the indignant student captured in this video is a "whiner." Here's a link to an article that reduces this legitimate protest to students' being "crybullies." Haters that say these thing are reinscribing white privilege by deciding to be power neutral and power evasive in order to trivialize the lives, experiences, and lived realities of the other half of society that they either disparage or ignore. They individualize problems that are deeply historic and social in order to not have to face up to unearned privilege or deep-seated assumptions of merit in this society that this growing, student movement and counter-narrative threatens. Incidentally, whiteness is an ideology; so anybody could be "white." And whiteness is a dangerous and pernicious ideology that subscribes to individualism, individual merit, and the myth of white superiority. It is a global problem. It exists within minority communities, too. More fair-skinned children are often preferred to darker ones. "Marry well" sometimes means to marry white. The sociological term for this is internalized racism. I could go on and on. No one on the planet is untouched by the myth of white racial superiority, my friends. Until we acknowledge this—alongside the myth of male superiority ("patriarchy")—we will continue seeing conflict both within our families and between them, and in society as a whole. Peace and blessings to all this coming Thanksgiving. May we reflect on all of these things and act to make a better world. Appearing below is an up-to-date list of their demands. I trust and hope that all of this action means that positive change is on the horizon in our academic institutions. Across the nation, students have risen up to demand an end to systemic and structural racism on campus. 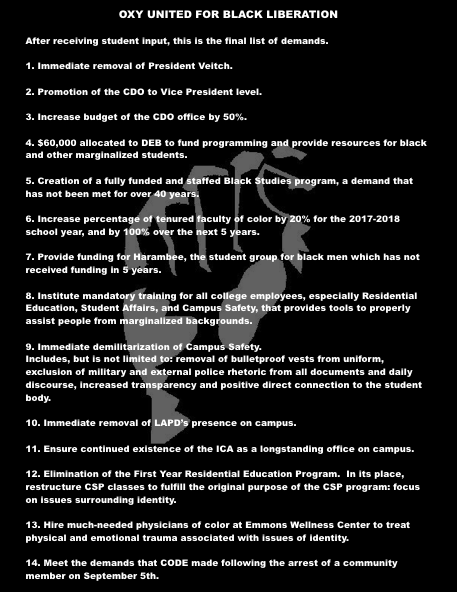 Here are their demands. Note: These demands were compiled from protesters across the country. These are living demands and will grow and change as the work grows and changes. If you have demands that are not listed, please send them to sam@thisisthemovement.org or @samswey. Here's a post to Valerie Strauss' blog on an age-old problem, namely, the political double standard regarding support for bilingual education in the U.S. It was interesting to read herein that out of the worlds' 195 countries, 163 of these are officially bi- or multilingual. Rather than about evidence, debates surrounding bilingual education have been about politics—impacting a perceived sense of a loss of centrality for monolingual English speakers. Analyses should also factor in the correlation that exists between depression and language loss. Not everyone thinks that bilingualism is a good idea, however. A common argument confuses promoting bilingualism with promoting lack of fluency in English. Karin Davenport, of U.S. English, for example, calls government-funded support for multiple languages a “crutch” that allows people to remain “linguistically isolated.” But again, research is clear. 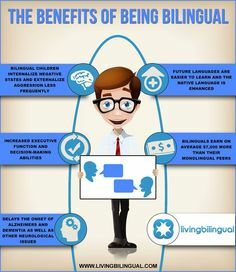 All research on this topic, from multilingualism to the causes of language endangerment, has shown that immigrant kids will most likely pick up the major language within a generation, whatever the policies are. In the United States, second-generation fluency in English is around 80 percent, while third generation fluency is well over 90 percent. The tipping point, Card and his collaborators note, has been slowly but steadily rising, from an 11.9 percent minority share in the period from 1970-80, to 13.5 percent in 1980-90, to 14.5 percent in 1990-2000. I have known about the tipping point for some time, but didn't know that the tipping point was so low. Despite some level of optimism expressed in this piece herein, these numbers still speak volumes about race relations in the U.S. and specifically, how race and class combine in pernicious ways to limit educational opportunity, in particular, for our youth. 43.5 percent of black students attended majority white schools. By 2011, the percentage had fallen to 23.2. As this piece states, affordable housing in middle class communities is an important policy goal. However, as covered in this piece below, such remedies are not without their challenges. As is the case with most challenges, we need good minority representation at all levels. Poor people need to not only vote, but they also need to vote their interests, including the kind of representation that advocates for affordable housing in middle class neighborhoods. In tandem with this, our communities need to continue to advocate for a living wage, quality schools, low-interest debt funds for minority communities to start and expand non-profits. Opportunities to establish cooperatives and small businesses are also necessary. On June 25, 1974, suburban residents of Detroit won their four-year battle to overturn court-ordered busing of black city students across county lines into their schools. In a key 5-4 Supreme Court decision, Milliken v. Bradley, Chief Justice Warren Burger declared that 41 white suburban governments had not committed “significant violations” of the Constitution. No single tradition in public education is more deeply rooted than local control over the operation of public schools; local autonomy has long been thought essential both to the maintenance of community concern and support for public schools and to quality of the educational process. The victory in Milliken was based on the assumption that African-Americans would be bused in, not that they would be living next door. What was not anticipated was a black exodus from Detroit as African-Americans capitalized on new housing laws to move away from the decaying city. The white response to this migration? Flight from inner-ring suburbs. Southfield, Mich., for example, which had been 0.7 percent black in 1970, by 2010 had become 70.3 percent black, and its schools nearly 95 percent black. Over the same time period, Ecorse, a suburb southwest of Detroit, went from 0.4 percent black to 44.5 percent, and its school system to 72 percent black; Oak Park from 0.6 to 57.4, and its school system to 95 percent black; Harper Woods from 0.3 to 45.6, and its school system to 88 percent black. 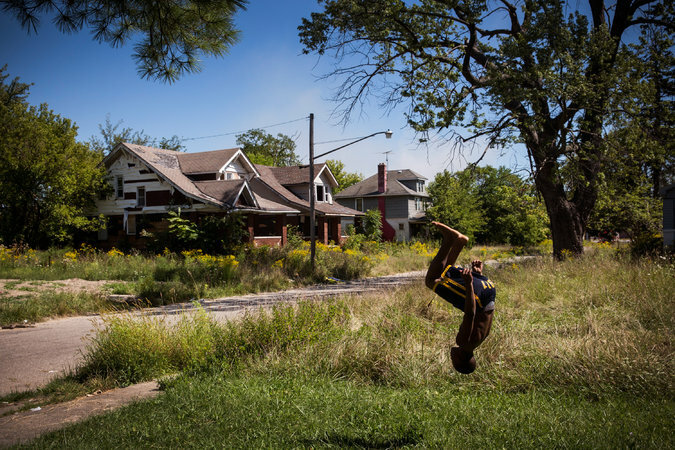 These suburban Detroit communities provide a case study in what has come to be called the “tipping point,” the point at which whites begin to leave a residential locale en masse as African-Americans or other minorities move in. This phenomenon puzzled Thomas Schelling, a professor emeritus of economics at Harvard and a Nobel Laureate, who was struck by the lack of stable integrated communities. In 1971, he began work on a mathematical theory to explain the prevalence of racial segregation in a paper titled “Dynamic Models of Segregation,” published in the Journal of Mathematical Sociology. Schelling’s most striking finding is that moderate preferences for same-color neighbors at the individual level can be amplified into complete residential segregation at the macro level. For example, if every agent requires at least half of her neighbors to be of the same color―a preference far from extreme―the final outcome, after a series of moves, is almost always complete segregation. In other words, residential segregation can emerge even if initial preferences are very slight. in an all-white neighborhood, some residents may be willing to tolerate a maximum of 5 percent black neighbors; others may tolerate 10 percent, 20 percent, and so on. The ones with the lowest tolerance level will move out if the proportion of black residents exceeds 5 percent. If only blacks move in to fill the vacancies after the whites move out, then the proportion of blacks in the neighborhood may reach a level high enough to trigger the move-out of the next group of whites who are only slightly more tolerant than the early movers. This process may continue and eventually result in an all-black neighborhood. Similarly, an all-black neighborhood may be tipped into an all-white neighborhood, and a mixed-race neighborhood can be tipped into a highly segregated one, depending on the tolerance. In the years since 1971, scholars have followed up on the Schelling argument with empirical studies. Most major metropolitan areas are characterized by a city-specific ‘tipping point,’ a level of the minority share in a neighborhood that once exceeded sets off a rapid exodus of the white population. Neither Schelling nor Card addresses the specific question of integrating poor African-Americans into middle class, majority white neighborhoods. The percentage of people living in neighborhoods of high concentrated poverty — census tracts where the federal poverty rate is 40 percent or more — has been growing steadily over the past two decades. Moving the poorest residents out of such neighborhoods would involve finding homes for nearly 13.8 million people. Young people from high-poverty neighborhoods are less successful in school than their counterparts from more affluent communities; they earn lower grades, are more likely to drop out, and are less likely to go on to college. Neighborhood environments influence teens’ sexual activity and the likelihood that girls will become pregnant as teenagers. And living in disadvantaged neighborhoods significantly increases the risk of disease and mortality among both children and adults. Who actually lives in very poor neighborhoods? According to the Century Foundation, 25.2 percent of African-Americans, 17.4 of Hispanics and 7.5 percent of whites. Black children under the age of 6 are the likeliest to live in high-poverty neighborhoods; 28 percent of African-American children of that age live in them. At the same time, the evidence of the benefits to children of living in better-off (low poverty) neighborhoods is growing, according to the latest findings from the Moving to Opportunity experimental project. These benefits — in improved school performance for poor black children, higher college attendance rates, increased marriage rates and greater future annual income — have put liberal advocates of integration on a political collision course with white communities with their own anxieties about tipping points. as racial integration was temporary in Detroit neighborhoods, so it appears to be in its suburbs. Half of the suburbs that were racially diverse in 2000 had become predominantly nonwhite in 2010, and most of the integrated suburbs in 2010 were in the process of resegregation. In other words, in the case of the Detroit metropolitan area, moving poor children out of high-poverty communities into less poor sections that are themselves on a path to greater poverty is at best a stopgap measure. New housing construction must be roughly in line with metropolitan population growth. Second, every city and town in a metropolitan area should be required to ensure that the new housing built reflects the income distribution of the metropolitan area as a whole. These two policy initiatives, along with others requiring aggressive intervention, are hard to bring about in the absence of a national consensus. Without concerted action, the more likely prospect is the continued growth of neighborhoods with high concentrations of poverty. The reality is that integration of the nation’s public schools – despite notable if modest successes with elite exam schools — has been on a steady downward path since 1988, the high point. That year, 43.5 percent of black students attended majority white schools. By 2011, the percentage had fallen to 23.2. The average white person today lives in a neighborhood that includes more minorities [27 percent] than was the case in 1980, when such neighborhoods were nearly 90 percent white. Moreover, each of the nation’s major minority groups lives in neighborhoods that are at least one-third white. There may be a trend, then, toward a growing number of stable, middle class integrated communities. But that does not mean that these middle class communities will unambiguously open their doors to the minority poor. Even residents of Marin County in California, a bastion of Democratic liberalism, have protested proposals to build affordable housing. In May 2014, the California Assembly passed legislation reducing the obligation of Marin County to build low- and moderate-income housing. If Marin County – as one writer put it a couple of years ago, “the most beautiful, bucolic, privileged, liberal, hippie-dippie place on the earth” — is having a hard time accepting affordable housing, the path out of impoverished neighborhoods for substantial numbers of black children will be arduous. Government action has often been resisted but, over time, it has pulled millions of blacks into the mainstream of American life. From 1940 to 2014, the percentage of African-Americans ages 25 to 29 with high school degrees rose from 6.9 percent to 91.9 percent. Over the same period, the percentage of blacks with college degrees grew from 1.4 percent to 22.4 percent. From 1963 (a year before enactment of the Civil Rights Act of 1964) to 2015, the percentage of blacks employed in management, professional and related occupations more than tripled, from 8.7 percent to 29.5 percent. Although progress toward racial and ethnic integration has been sporadic – frequently one step forward, two steps back – credible progress has been made over the last 75 years. We have not come to the end of the story, but there are grounds for optimism. These comparative statistics on Civic life in Texas and the U.S. by the Annette Strauss Institute at UT should deeply concern us. You may download the full report here. I knew it was bad but am now seeing just how bad this all really is. 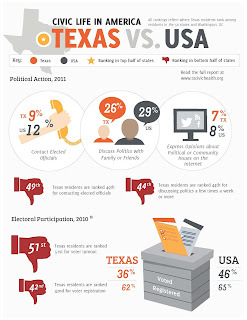 In terms of 2010 electoral participation, Texas residents are ranked 51st for voter turnout; 42nd for voter registration. I'm really also amazed at the very low percent of folks that express opinions on the Internet at both state and national levels. All of this information is helpful. Our children are always told that they should prepare for high-tech employment. Little do they know that this backdoor route for companies to acquire skilled labor stands to lower their wages once employed in these firms. How convenient for these companies that game the visa system. According to research by Howard University Ronil Hira, out of 85,000 visas available annually, only 20 companies received more than 32,000 these. "Global outsourcing companies have dominated the program, winning tens of thousands of visas and squeezing out many American companies, including smaller start-ups. " Since many H-1B workers earn salaries below the market rate—below what skilled, American workers tend to earn—these companies are intentionally undercutting American workers for these same skilled jobs. The policy solution is for H-1B visa process needs to be more closely regulated so that 20 companies do not have an undue influence on the overall process. one-third of all H-1B visas in 2014. This piece issues a dire warning for the future unless we work together as countries to attend carefully and strategically regarding such matters. Thanks to David Weiner for sharing. An estimated 300 million people could find, 45 years on, that they simply won’t have enough water for all their needs, according to new research. much of the world’s drylands will increase as global average temperatures rise. higher altitudes and melting ever earlier. This is bad news for agricultural communities that depend on a reliable flow of meltwater every summer. California is already in the grip of a sustained drought, made worse by lower falls of snow. Great tracts of Asia depend on summer meltwater from the Himalayan massif and the Tibetan plateau. Justin Mankin, an environmental scientist at Columbia University’s Earth Institute in the US, and colleagues report in Environmental Research Letters journal that they studied 421 drainage basins across the northern hemisphere. computer simulations of a range of possible future patterns. ground as a reservoir of summer water. Balkans, the Caucasus nations, and northern Turkey. It also includes the Shatt al-Arab basin that brings meltwater from the Zagros mountains to Iraq, Syria, eastern Turkey, northern Saudi Arabia, and eastern Iran. Research has linked civil conflict in the region and in other parts of the world with climate change. The message of the research is that national, regional and civic authorities must start planning for change. likely to accompany future socio-economic changes. for The Guardian for 32 years, for most of that time as science editor. He has been covering climate change since 1988. This is a really amazing HBO Latino music documentary titled, The Latin Explosion: A New America, that indeed doubles as a lesson in civics. It was wonderful to see the evolution of Latino identity in the U.S. through this documentary. It is so hopeful. And it portends exceedingly well for diversity in the U.S., generally, and the lived, U.S.-Latino experience itself. The best moments come early in “The Latin Explosion: A New America,” an hourlong HBO documentary on Monday night. Desi Arnaz dancing with his conga and wailing “Babalú.” Rita Moreno laying down the law in “West Side Story.” A series of early rock ’n’ roll one-hit wonders matched with their real names: Sam the Sham, a.k.a. Domingo Samudio; Question Mark (of Question Mark and the Mysterians), a.k.a. Rudy Martinez; Cannibal (of Cannibal and the Headhunters), a.k.a. Frankie Garcia. “Explosion,” a history and civics lesson in the form of a music documentary, traces a straight line through more than 60 years of Latin rhythms and fancy footwork. 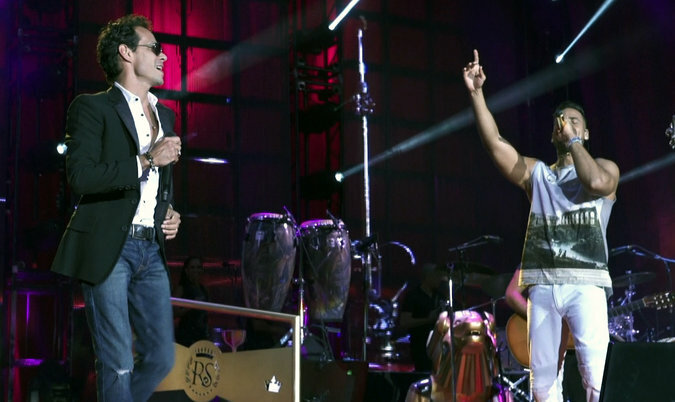 From Arnaz to José Feliciano, Celia Cruz, Gloria Estefan, Ricky Martin, Marc Anthony, Jennifer Lopez, Shakira and Pitbull, it’s an unapologetic celebration of crossover commercial success, consistently grounded in stories of hardship and struggle. The capsule biographies, with their copious performance footage (the main reason to watch), are accompanied by statistics on the growth of the Latino population in the United States and occasional forays into political and cultural history, to name check figures like Herman Badillo or Cesar Chavez. Fans of the music might note some omissions — no Enrique Iglesias, Christina Aguilera or Paulina Rubio, for instance. (Anacani, a singer on “The Lawrence Welk Show” who was many television viewers’ only connection to Latino culture in the 1970s, pops up on screen singing “Feliz Navidad” but isn’t identified.) Those same fans might note that the documentary was conceived by the music executive Tommy Mottola, who has worked with Ms. Estefan, Ms. Lopez, Mr. Anthony, Mr. Martin and Shakira. Mr. Mottola’s wife, the Mexican actress and singer Thalia, also appears. The film is less a documentary than a very nicely produced public service announcement, something that would look at home as the centerpiece of a rally or a convention. The sense of commercial and cultural-political imperatives outweighing artistic ones grows as the timeline approaches the present day, and reaches its apotheosis in a segment on the buying power of Latinos. Pitbull is shown shilling vodka, Bud Light and Dr Pepper and says in an interview, “We’re a very loyal culture, that’s why products want us so bad because we’re loyal consumers.” At which point Chavez begins to spin in his grave. But most of the documentary is devoted to music, and the sounds and images help the time pass easily enough. From the joyousness of Arnaz, to the polyester splendors of the 1970s salsa scene in New York, to the supreme showmanship and clarion voice of Mr. Anthony, “The Latin Explosion” is a convincing statement in an argument that was won long ago. This is exciting and something to keep track of as SB1174 is the proposed legislation that will remove the major provisions of the Ron Unz Prop. 227 bill in education. I understand it has bipartisan support, but definitely needs to be advocated for by the larger community. This would of course be a hugely symbolic victory for states across the nation. 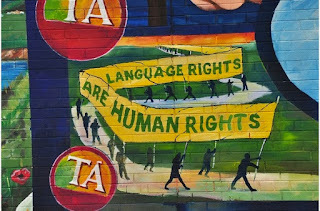 SB 1174: The next struggle for language rights in California is here! "The Storm that Swept Mexico" is a great Mexican Revolution documentary and accompanying grade 9-12 curriculum that you can download here. 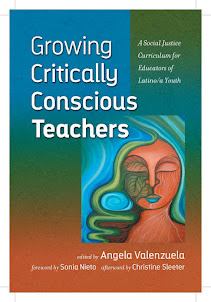 It's great to have our children experience dual language education; but we always need to remain vigilant about the power relationships that always inform what actually happens at ground level. Once the mainstay of immigrant children, bilingual instruction has a new band of converts.